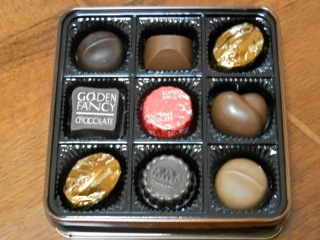 Japan's Valentine's Day is an occasion on which women give chocolates to men whom they love. However, recently there are obligation chocolates called Giri-choco which people give to those who good care of them and friendship chocolates called Tomo-choko which are exchanged among women. The event is on 14th of February every year. Usually chocolates are given in school. This year it fell on weekends, so most girls gave them earlier on the Friday or later on the Monday. Men give back something on White day, 14th of March. On this day, something other than chocolates are preferred as return gifts. Cookies are popular, for example. Men who are given many chocolates would be so much pleased, although they need to prepare lots of return gifts. Women are said to give chocolates not only from their love, but also to enjoy return gifts. As for me, I received 4 chocolates. I gave cookies back. On the Valentine's Day, I was excited to know if I would receive any chocolates, and on White Day, I was thrilled to see if my gifts would be accepted favorably. Valentine's Day and White Day are the most thrilled and excited day of the year.